It's New Year's Resolution time. While I don't tend to set New Year's Resolutions, I do think of some goals for the next year. One thing I'm going to try to do is lose more weight - mini-size my belly. I've dropped a good bit since coming to Japan, but there's a long way to go. I can start by eating less at each meal... but you didn't come here to hear about my plan for getting in shape. You came here to look at little cards. Topps Mini cards aren't exactly mini. They're more "small" than "mini" - if they were mini they would be tobacco card-sized. But I still enjoy them. The gold parallels are numbered to 99. The silver are numbered even smaller. There were Minis distributed at the National. This is one of those cards. It is now in my collection. Notice the National notation in the upper-right? And the cards are specially numbered too! Unlike some manufacturers who take their regular cards and simply foil-stamp or emboss a National logo or notation on the top. Mini card, normal-sized relic piece. The foil name disappears in the scan over the black background. How can you congratulate me on getting an Adam Dunn card? "It could be worse, we could have gave you a piece of John Goodman's underwear." The minis are kind of cool but not cool enough to really chase. I miss the 1980s minis (or Topps Big for that matter) with the cartoons on the back. Bring back the fun! I have a love/hate relationship with Topps Chrome and Topps Finest. With Topps Chrome, I'm getting the same cards as the flagship Topps set, but they cost more and they're covered in aluminum. 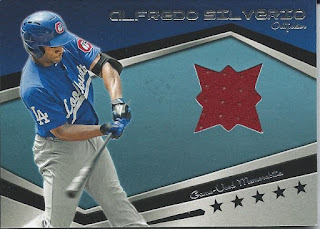 But Chrome has some good-looking colored parallels. For Finest, again the cards cost a good bit more than flagship cards and have that aluminum coating. And I also get a rainbow of parallels. But I get a new design. X-Fractor or whatever they're called these days. Not bad. This looks so much like a Panini insert. Green refractors are the coolest! Regular refractors are nice too. Oh, hey, another die-cut. Topps Chrome has a Die-Cut insert set, and so does Finest. Actually, this is the annual Finest Moments insert set, and it's not as cool as the Chrome die-cut set. But it's still nice. Who would have thought one of the toughest cards to find would come from 1997 Upper Deck? I built most of this set last year, but could not for the life of me locate a copy of card 417. Maybe it was on the Beckett Marketplace, but if it was, it was overpriced when I checked. Nobody had it for trade and I could never find any for sale on COMC or SportLots. But while searching for deals on Black Friday, I found one at a great price. Sometimes, cards just don't fit in categories. Then, you create a category called "Other" - this is that category. A bit of triple jersey Team USA going on here. Why triple jersey? Why not four jersey? Why not jumbo swatch? It all came from the same shirt anyway. I put together my 2012 Opening Day collection mainly through packs, though I found a plate off eBay and I still need the autograph. But I no longer need the 3D card. My silly scanner chopped off most of the frame on this Allen & Ginter relic card. It's too late to fix it now! Another Braves prospect, this is Carlos Perez. He plays in Rome, where I've seen a few games. The stadium is nice, but nothing special. But I did get to see Julio Franco play before he was called up to the Braves during his last season. As one would expect, he was tearing the opposition to pieces. Carlos Perez, on the other hand, had a real tough time pitching for Rome, so he was sent to the Appalachian League, where he was fairly successful. Unfortunately, he was signed in 2008 and he can't seem to get out of the mountains. I've seen Greensboro play in person. I don't think Yelich was with the team at the time. Grasshoppers are fun. Until they bite your finger. I'm not sure why I bought this card other than needing it for my type collection. It must have been really cheap. A minor league relic from the Lookouts. They play in Chattanooga, which isn't too far from where I used to live in Georgia. I liked them better in their red uniforms when they were owned by another team, because their logo uses red. It just doesn't look right in blue. 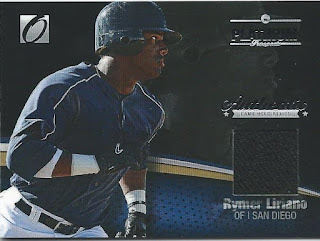 This jersey relic card of Rymer Liriano is from Onyx. It is the first and might be the only Onyx card I ever own from 2012. Two hits for the price of one post! This time, let's look at Triple Threads, Tribute, and Tier One, three sets I'll never buy packs from. Green. Triple Threads parallels don't stand out like Chrome did two days ago. Red. The serial numbering is right on the front, so you can see how limited your parallels are right away. 99! That's a good sepia parallel. Base. Matt Kemp sure is happy about something. Of all the cropped photos I see in this post, this card really needs some context. Topps Tribute is a beautiful set, similar to the Gold Label issues around the turn of the century. I will try to put together a Tribute base set someday. Until then, the green parallel glows like a fuel rod from Springfield's power plant. The black parallel doesn't look too bad, though my scanner trims it a bit. Now for Tier One. 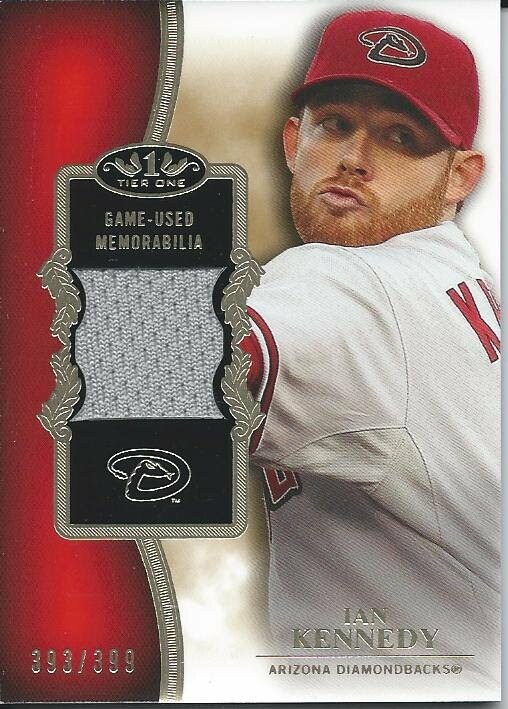 Here's a high-numbered relic card. And a high-numbered autograph. Granted, this numbering in flagship Topps sets would make the card quite difficult to pull. But in limited, high-dollar releases there's not much value in triple-digit serial-numbering of lower-level players. I still need the card for my type collection though! ...my mailbox gave to me: nine Topps Heritage cards. Yeah, it doesn't fit the song structure, but I don't care! This is my first look at Topps Heritage other than the blogs. Not that I was really surprised with what I saw, since it was all over the blogs many months ago. Yes, this is a Heritage Minors insert card I started off with. And then a little floating head. These are kind of cool, but floating heads freak me out. Chrome! Give this next video about a minute to really get started. Then you should get the joke. Did you get it? Huh? The card has a blue sheen in the scan and... no, okay, that's not it. Hey, it's the MLB version of Prospect Performers! Go Kemp Go! Shouldn't there be some serious connection between the two players? Black parallel with a cheater. Black listed! Ha! 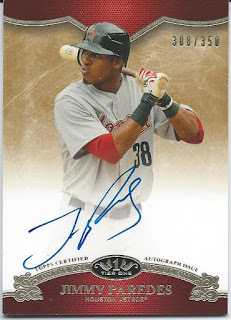 Last, a Minors on-card autograph. I prefer the autograph box to just be faded - the abrupt big blank spot just looks bad. Or don't fade at all, and pick appropriate photos where the blue, black and/or red ink will show. But the Storm have the coolest hat logo I've seen in a long time. Today, I leave for South Korea. By the time you read this, I should be settled into my hotel room, most likely enjoying fish and chips at a pub I've read about. Don't worry, I'll be digging into the barbecue and kimchi soon enough. But recently, my Black Friday haul from COMC.com finally arrived at my doorstep. I wish I could have bought more, but I don't have tons of US money and paying with yen just isn't an option. I'm really happy with what I have. I'm going to split this up so enjoy! We'll start with the Chrome. I mainly grabbed parallels, since, well, that's all there is with Chrome. Here's an orange refractor. It looks red, doesn't it. Here's the black refractor. Thanks to my scanner, you can't see any of the black border. Oh well. This is the regular refractor. Blue refractor. My scanner doesn't seem to like colors on Chrome cards. And I picked up a rookie autograph! Maybe Tyler Pastornicky will become a superstar shortstop... he was the Braves opening day starting shortstop, after all. Oh, he can't field? And was hitting only .242? Maybe he just needs a little more seasoning. While on one hand I'm not a big fan of Chrome, the different refractor colors look really great. And this card looks awesome. I really like this die-cut insert! With team colors used in the background, a full set should provide a nice rainbow to look at. But there are 50 cards in the set. If you have extras of these you want to part with, feel free to send them my way! Is this my favorite card shop in Tokyo? Why do I consistently find myself back at the Kanda Mint store? It doesn't seeem to make sense, because other than recent BBM and Calbee, the location doesn't carry a big NPB selection. This is why. I continue to find random sets I didn't know existed. This set is limited to 500 cards, though each card isn't serial-numbered. There are 20 players on the checklist, but I only found a few worthy of taking for the Women in Sports collection. I'm sure a couple more are missing so I'll have to dig up the checklist and figure out what to hunt for. I'm going to make an effort to get year-appropriate cards for my Nippon Series collection. And I'm going to try to have a common theme between the two teams. For 2011, I've decided to go with mascot cards. I found a Hawks card from 2012, which is pretty close. The back of the card shows the whole Hawk family. A team with eight mascots? They can almost field an entire team of plushies! The Dragons played the Hawks in the 2011 Japan Series, and Doala the Koala is their mascot. Again keeping the consistency as much as possible, this is a 2012 card. For the 2008 series between the Lions and Giants, I picked up two Calbee inserts commemorating the games. Unfortunately this card is horizontal, but it'll do. An unexpected surprise was the availability of 2013 Historic Collection singles. The 2013 issue focuses on famous jersey numbers. Green cards signify active stars. The purple cards are reserved for retired players. I didn't see Tuffy Rhodes but I found Randy Bass. The insert set is called Great Numbers and pairs two players who wore the same jersey number. Interesting that Boomer Wells and Randy Bass shared a jersey number. As I continue to find new interesting cards, I came across a bunch of 100 yen insert singles. I'll have to go back to those later. But I picked up two 2004 Hawks inserts. Plus a 2004 Marines insert. My excuse for visiting was to find Yu cards for Napkin Doon. Mission: accomplished. All the Yus yu see here are going to the serviette. Two nice Calbee cards start off the stack. Excellent Player? Yu got it. Top of Fighters? Yu know it. Does he have the Fighting Spirit? Yu bet he does. Is he the Prince of Power Pitch? Yu couldn't be more right. This set must have just came out. No idea. But I did see recently that a couple other (baseball) sets have been released and I need to get back to the card shops right after Christmas to pick up a couple singles and sets. This particular card is from a J-Pop talent show of some kind. Several groups have cards for each member, plus two group cards; the set has a total of 72 cards. UMU is a Universal Music J-Pop idol girls group competition, and it looks like it's held annually. I found information that says the next competition is December 26th in Harajuku. I won't be there. Speaking of recent sets, another oddball I found was this box set featuring Japan's nine best swimmers - four men and five female. Each subject has three cards in the set. I grabbed all 27 cards for 300 yen. Deal. While I may have been going for the Darvish cards, my biggest pick-up was the complete No-Hitters set. It ran me 1200 yen, which is much cheaper than other stores had it for, and knocked about 90 cards off my want list (which would have cost me 3000-5000 yen one-by-one). Plus the set looks great. So why do I keep going back to Mint Kanda? There's always something different, something cheap, and something fun worth buying! It's tough to call it my favorite, but it ranks right up there with Mint Ikebukuro. I find that funny because I initially dismissed the shop due to its lack of inventory and its location away from other places I like to visit. But it's really only a short walk from Akihabara, with its own card store and plenty to see and do. Return to Nagoya Mint CAPS: Cardstravaganza! Mint Ikebukuro's CCG Store - Japanese MLB Cards!